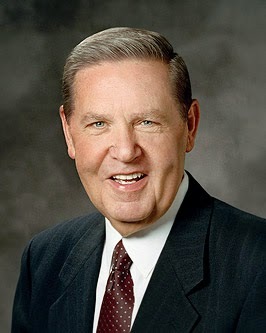 Elder Jeffrey R. Holland (born December 3, 1940) served as Church Commissioner of Education from 1976-1980, as the president of BYU from 1980-1989, as a Seventy from 1989-1994, and as a member of the Quorum of Twelve Apostles since 1994. "I ask everyone within the sound of my voice to take heart, be filled with faith, and remember the Lord has said He 'would fight [our] battles, [our] children's battles, and [the battles of our] children's children' (D&C 98:37, emphasis added). And what do we do to merit such a defense? We are to 'search diligently, pray always, and be believing[. Then] all things shall work together for [our] good, if [we] walk uprightly and remember the covenant wherewith [we] have covenanted' (D&C 90:24). The latter days are not a time to fear and tremble. They are a time to be believing and remember our covenants." 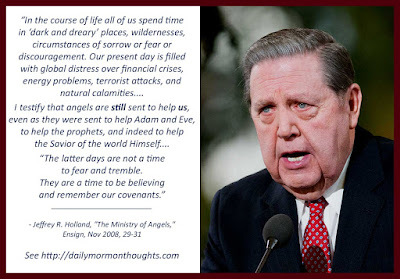 Elder Holland spoke of Lehi's experience of being in a "dark and dreary waste" and finding help and comfort as an angel came to lead him "to safety and ultimately to the path of salvation." He likened that to our time and situation; we often seem to be in "dark and dreary" times in our lives as the world's circumstances bring discouragement or fear. Those times are a necessary part of mortality; we should not be surprised when they come. And we should not be overly discouraged. Gratefully, we are not forsaken; angels are still sent to guide and minister. So we should "take courage" and have faith that we do not need to struggle alone in the world's challenges. To merit the help promised by God, Elder Holland reminds us of the admonition to "search diligently, pray always, and be believing"—and when we have done our part, we can be assured the the promised angels will be at our side to sustain and protect us. Labels: angels, challenges, divine help, Holland Jeffrey R.